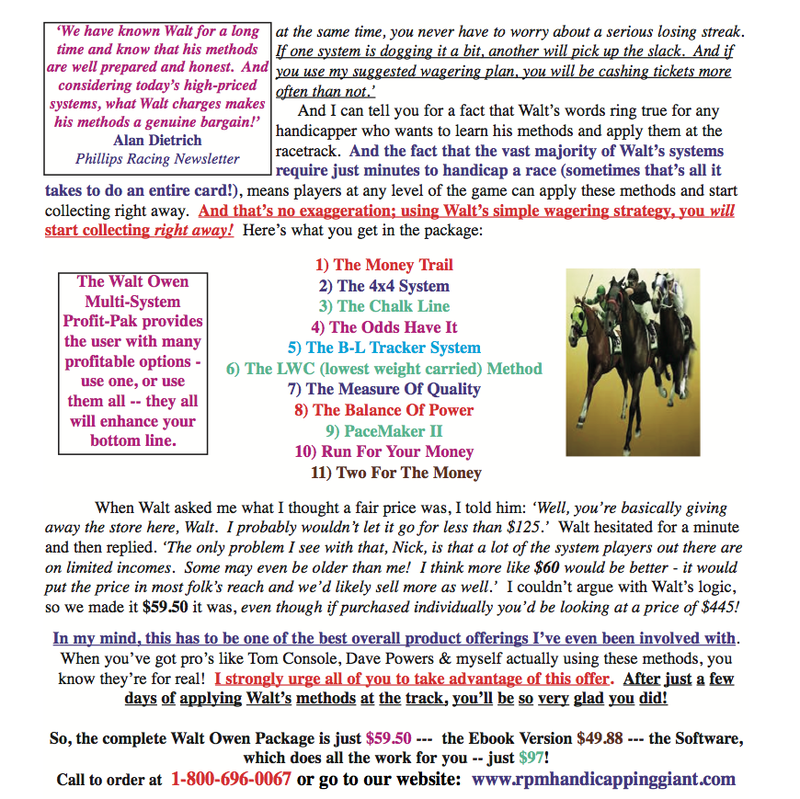 Walt Owen’s Multi-System Profit-Pak!! 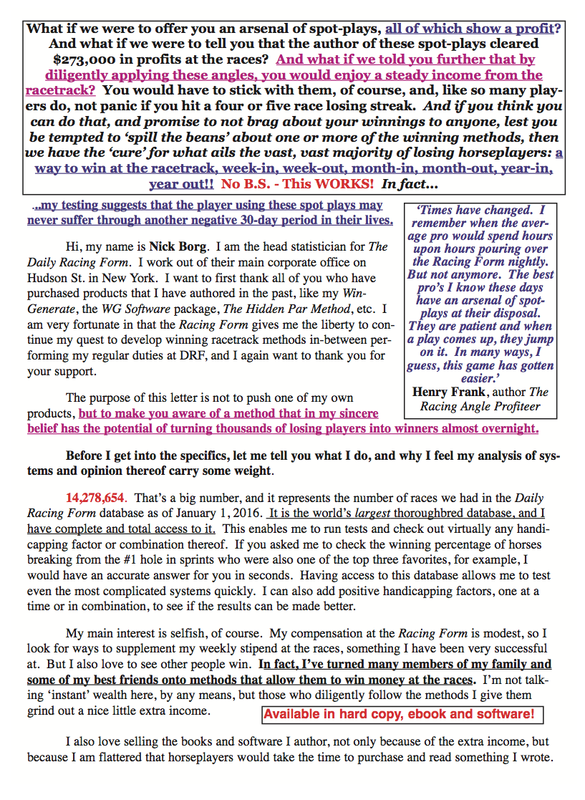 11 Profitable Easy-to-Figure Systems! In Software, Too!! 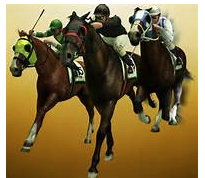 The Software — the WO11 Software is great at both straight and exotic betting. Below see a not uncommon scenario where just about every play suggested hits. Another great Exotic hit below. 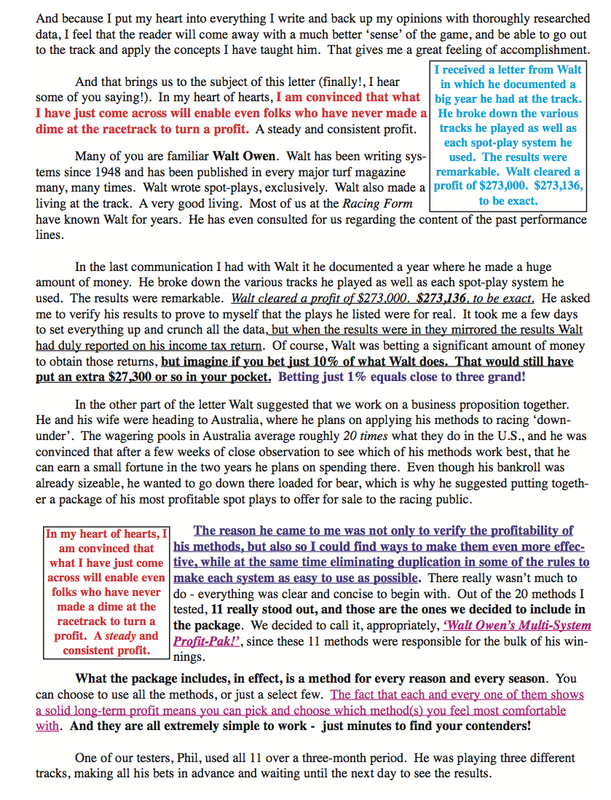 The Program contains 11 of Walt Owen’s most successful systems — he wrote over 100 — but these 11 had the best overall consistency and profit potential. 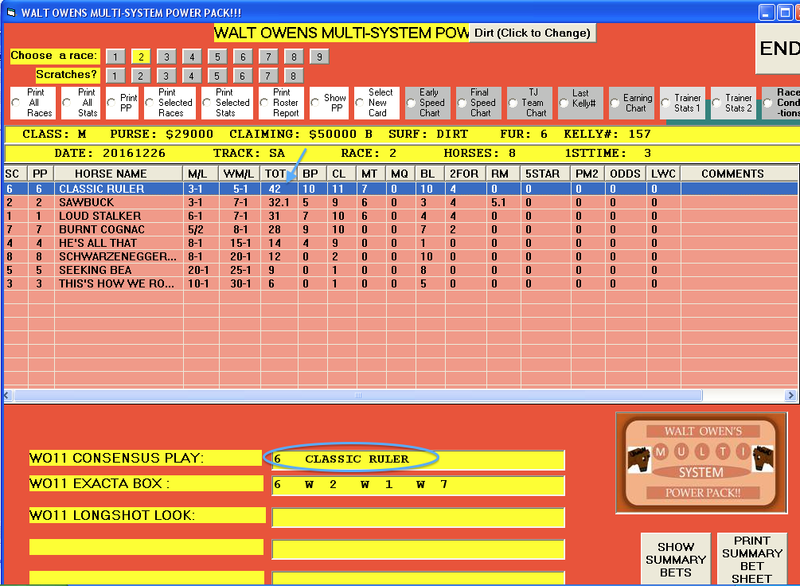 The program is designed so you can follow individual columns (systems) if you wish, or concentrate on the Consensus (TOT Column), which tallies all system scores into one score. We would suggest that if you have time you do monitor individual columns along with the Consensus, as you may locate systems that work best for you at your track. Since all the columns are sortable this is an easy task. 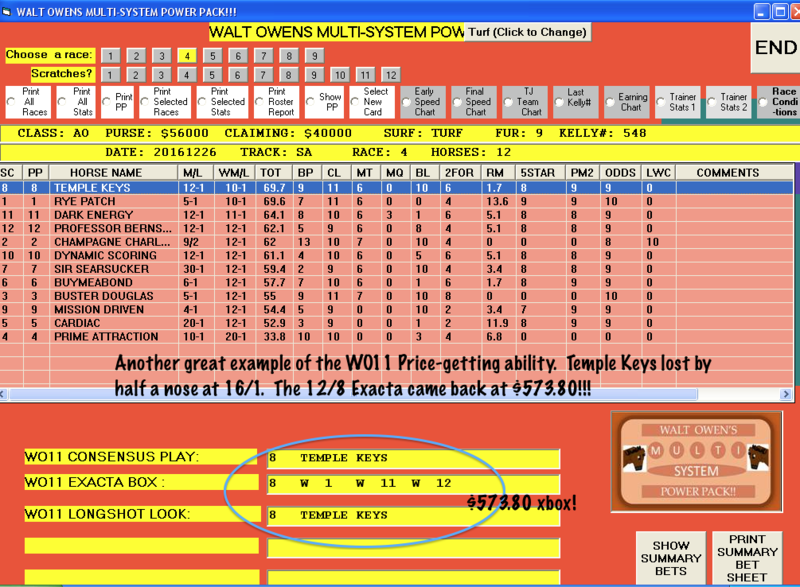 This program, overall, tends to go for ‘price’ in the TOT (Consensus Column) so it is wise to always include the WO11 Consensus Play in your exotic plans as well. While many of these systems are programmed almost exactly as the rules demand, others were massaged, or adapted, to include more races and horses. The BL Tracker System, for example, looks for horses who appear to be ‘sore’ but still in good enough shape to run with today’s competition. This column was adjusted to give the highest scores for what recent pp’s, work patterns, layoff info, etc., suggest are the ‘least’ sore. This adjustment worked much better in the overall TOT (Consensus). 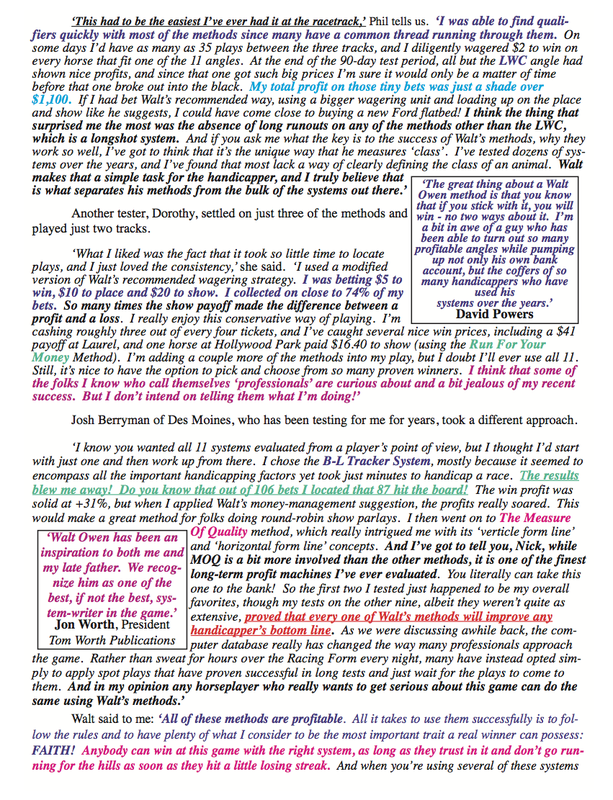 Balance of Power was coded to allow more plays — this is a rather difficult system to do longhand but the enhancements we made make this column one of the most ‘telling’, i.e., suggesting a big race may be at hand. Chalk Line, which involves betting favorites to place, was adjusted to give high scores to horses likeliest to win/place regardless of odds — this enhancement also had the effect of making this a good ‘stand-alone’ column as far predictability of a good performance. Our research shows the strongest win/place play overall is when the top TOT horse has an 8-point or more advantage over the second-highest scorer. The overall win/place % was 54.3%, meaning the Exacta contains this horse over half the time. Most races are very ‘tight’ overall regarding TOT scores, often with the top two or three horses being separated by just a couple of points. This suggest a wide-open race from a win standpoint, but the exotics are often viable in this situation. 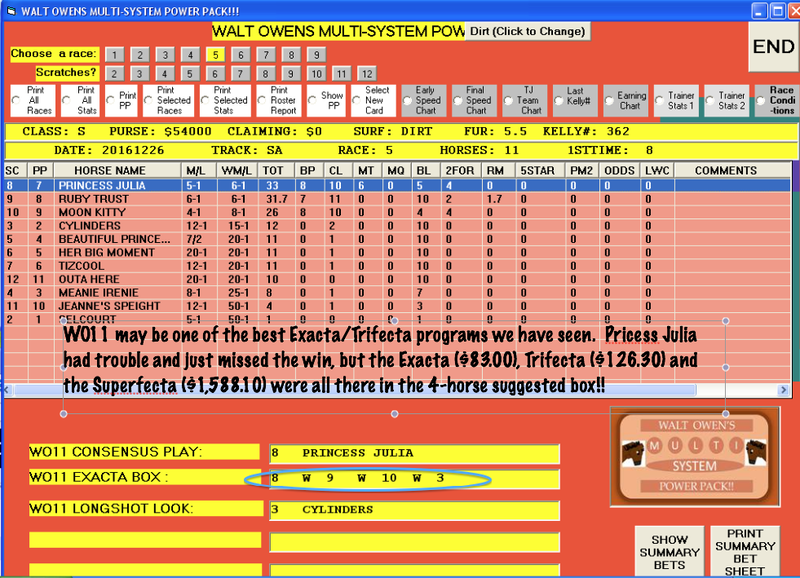 The WO11 has proven to be one of the better Exacta/Trifecta Box programs we have designed. Exactas hit often (@38% of the time) and Trifectas @22%. The payoffs, overall, were very generous in our studies.